Special thanks to Mrs. Yuko Kato, Mr. Ruiwen Song, Ms. Nozomi Ishizu, Mrs Kurly Burch, Ms Jennifer Alpern, and Mark Bennett Yuko Kato: Evacuee from Fukushima, member of the Kansai plaintiff group for compensation against TEPCO and government Ruiwen Song: Taiwanese freelance journalist. Prime-minister Shinzo Abe and the Japanese government as a whole including Fukushima prefectural government have repeatedly declared that “with regard to health-related problems (of the Fukushima accident), I (Abe) will state in the most emphatic and unequivocal terms that there have been no problems until now, nor are there any at present, nor will there be in the future.” (Abe’s statement at a news conference). See the Japanese government website here. In addition, the Japanese government is now planning to reuse the retrieved contaminated soil under 8000Bq/kg in public works projects all over Japan. This self-destructive program has now been partially started without any announcements as to where the contaminated soil are and will be reused, under the pretext of “avoiding damage caused by harmful rumors”. This project is tantamount to scattering lethal fallout of Cs137 equivalent to about 5 times that of Hiroshima bomb all over Japan. The Japanese government is literally behaving like a nuclear terrorist. CT-Scans are often cited as if they had no radiation risks, But this is not true. A recent study clearly shows that every CT-scan (about 4.5mSv irradiation) increases the risk of cancers in children by 24%. See the website here. One of the websites states: “In Fukushima, the indoor radiation doses are now so reduced that no radioactive cesium can be found in the air. Therefore, no radioactive particles can invade the human body during breathing.” What do you think of this statement? The Japanese government also ignores the long-term peril caused by “hot particles” ――micron-and- nano-sized radioactive particulates――which, if inhaled or absorbed into the human body, may lead to many kinds of cancers and other diseases including cardiac failure. We should consider internal irradiation to the cells near the radiation sources to be 500 times more dangerous than external irradiation because particles inside the body radiates very near or even inside cells, causing intensive damage to DNAs and other cell organs such as mitochondria. One of the main tactics that the Japanese government often uses to propagate the “safety of low level irradiation” is to compare artificial radioactivity with natural radioactivity. But this logic is a methodological sleight of hand. It is crystal-clear that even exposure to natural radioactivity has its own health risks. Cancers sickened and killed people long before artificial radioactivity was used. For example, Seishu Hanaoka, one of the founders of Japan’s medicine, carried out 152 breast cancer surgeries from 1804 to 1836. For example, potassium 40 (K40) is a typical natural radioactive nuclide. According to the Japanese government, the average internal exposure dose for adults from K40 is about 4,000Bq/year or 0.17mSv/year. See the website here (in Japanese). The extract you cite from the Fukushima government website is completely fake: “In Fukushima, the indoor radiation doses are now so reduced that no radioactive cesium can be found in the air. Therefore, no radioactive particles can invade the human body during respiration”. Reports from civic radiation measurement stations refute this claim. 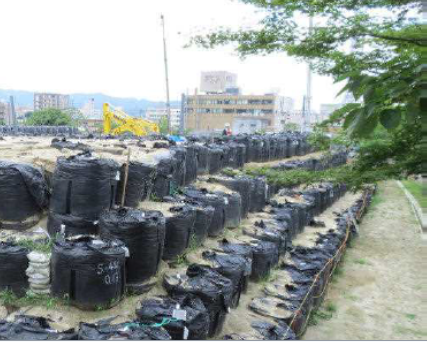 For example, dust collecting paper packs of vacuum cleaners used in Iwaki City, Fukushima prefecture, are radiologically measured and 4,800-53,900Bq/kg radioactive cesium was detected in Oct-Dec 2015. See the website here (in Japanese). One of the websites says that the Fukushima prefecture has conducted whole-body counter screenings of the 170,000 local population so far but cesium was rarely detected.” Does this mean that we can safely consume food from Fukushima, and Fukushima residents are no longer being exposed internally to radiation? This is a typical example of demagogy by the Japanese government: vague expressions lacking specific data, using the words “safe and secure” without clear explanation. 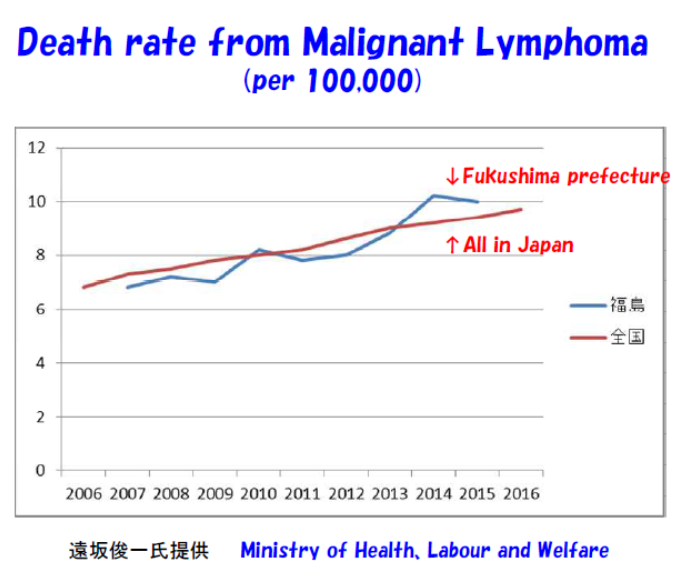 In reality, the government has not publicized any data indicating serious irradiation of the population. For example, you mentioned the Fukushima prefectural government website saying that whole-body counter screenings of 170,000 members of the local population have found radioactive Cs only in very few cases. However, the fact that no specific number is given makes the statement suspicious. Civic groups’ efforts for the disclosure of information has recently prompted city officials near the defunct plant to disclose the fact that it conducted whole-body counter check-ups on about 180 firefighters, nurses and municipal employees. According to Koichi Ohyama, a member of the municipal assembly of Minami Soma, the screening conducted in July, 2011, showed almost all of these people tested positive in Cs. The maximum Cs137 dose among the firefighters was as high as 140,000 Bq. This data reveals a part of the reality of irradiation but it is only a tiny part. 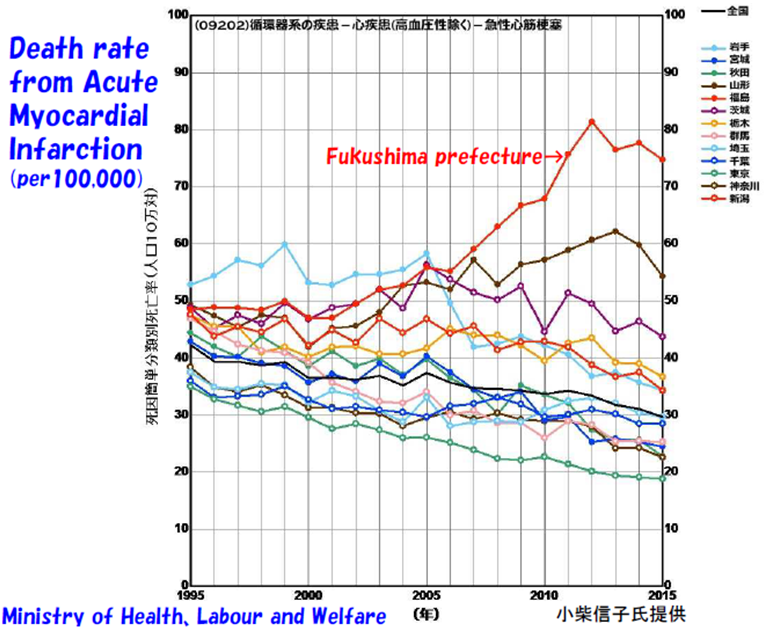 Japan’s population statistics reflect the health effects from the Fukushima disaster radioactivity. 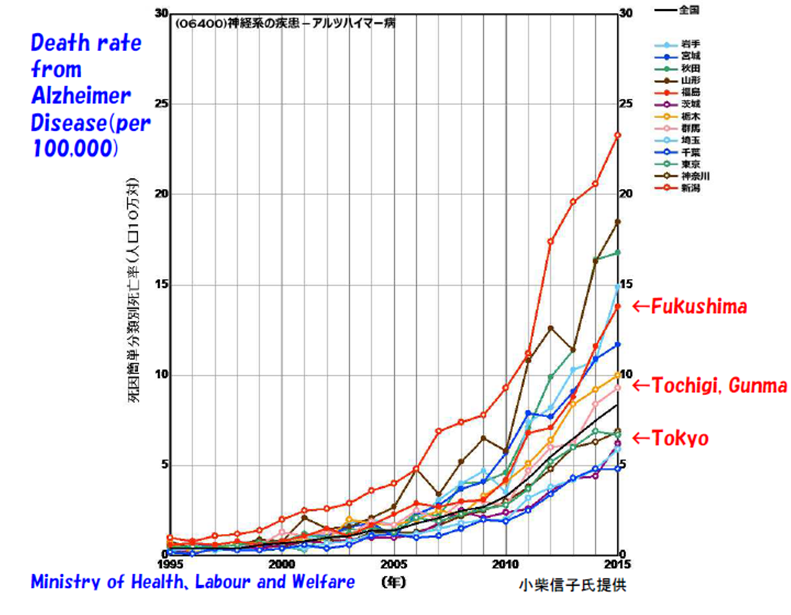 The following data clearly show that diseases increasing in Fukushima are highly likely to have been radiation-induced. The Fukushima prefecture website says, “After the Fukushima accident, the Japanese government has introduced the provisional standards for radioactive iodine and cesium. The Fukushima prefectural government subsequently strictly regulated distribution and consumption of food with levels of radioactivity exceeding the provisional standards. Now we have had this new much stricter standard. The distribution and consumption of food exceeding this new standard has been continuously regulated; therefore any food on the market is safe to consume.” Is it true? 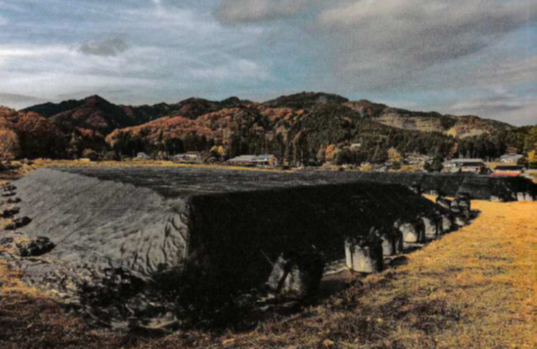 As for food contamination, the Japanese government has also tried to cover up the real picture. First, the current government standard for radioactivity in food, 100Bq/kg, is dangerously high for human health, especially for fetuses, infants, children and pregnant women. Even six and a half years after the accident, the Agriculture Ministry of Japan as well as many civic radioactivity measurement stations all over the country have reported many food contamination cases, although the frequency is evidently reduced. See the website here. We would like to ask about the situations in prefectures surrounding Fukushima. 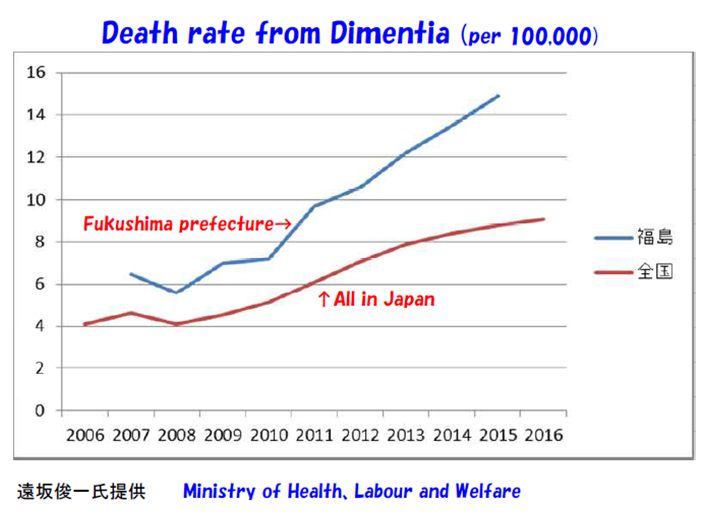 A television program once reported, “As for the safety of Tochigi and Gunma prefectures, few people are raising concern about health effects of radiation.” Is it true that the prefectures somewhat distant from the Fukushima Daiichi plant are now safe with no human risk? 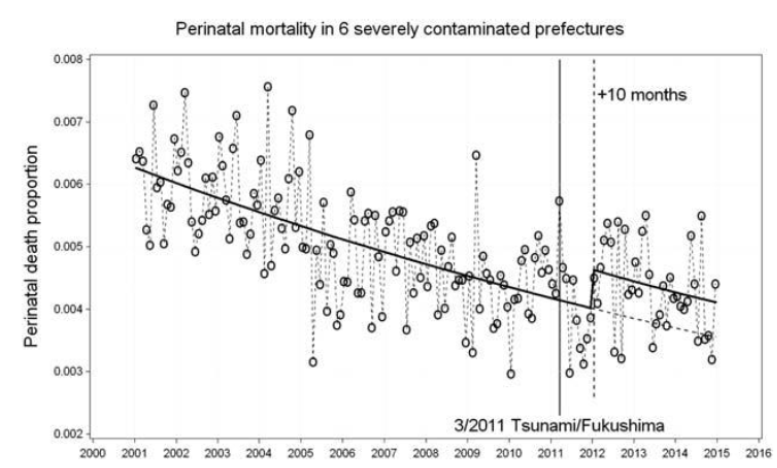 Another example is the statistics of stillbirth and neonatal mortality in Fukushima and the surrounding five prefectures (Tochigi, Gunma, Ibaragi, Miyagi, Iwate) shown here. 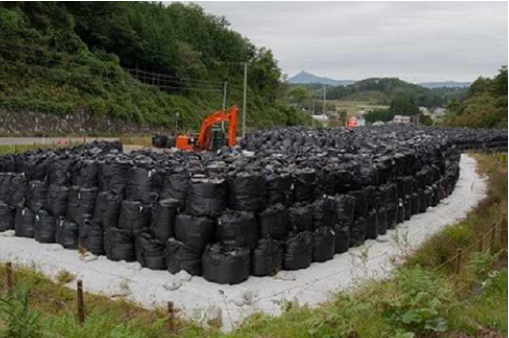 We must raise a question that, despite the government’s decontamination efforts, a huge amount of radioactive materials deposited in mountainous areas remain untouched. Now they are re-dispersing and re-depositing over wide areas of Fukushima and surrounding prefectures via winds, cars, trains, river water, pollen, spores, emissions from incinerators, in the form of radioactive dusts and particulates, among many others. For an example, see the following website. So I regret to say that, although these farmers’ endeavors you mentioned are very precious and respectable, they are not sufficient to completely eliminate the risk of radiation exposure from food. The problem exists objectively in the nuclear materials deposited on and in soil, algae, plants, houses, buildings, forests, animal and human bodies, not subjectively in the consumers’ sentiment or psychology. They seem to be among those experts who have been criticizing the general public’s tendency to demand “zero irradiation risk” as an obstacle to Fukushima reconstruction. As you know, cesium (Cs) has chemically similar characteristics to potassium (K). So it is true that higher levels of application of potassium fertilizer lowers the plant’s absorption, and therefore concentration, of radioactive Cs, decreasing Cs137/134 concentrations in produce, often to below the government standard of 100Bq/kg. But the following problems remain: (1) This procedure can prevent Cs transfer from the soil to produce only partly, not completely; (2) This process raises the potassium concentration in the produce and therefore heightens the burdens on certain human organs such as kidneys, the heart and the nervous system, causing new health risks; (3) Heightened concentration of potassium also leads to the heightened concentration of radioactive K40, so the reduced risk of radioactive Cs lead to an increased risk of internal irradiation by K40. Even if cesium concentration was reduced by applying more potassium fertilizer than usual, strontium contamination would remain. In Japanese government’s international press campaign as to the Fukushima accident, almost nothing has been said about strontium. If you have any information on strontium contamination, let us know. We regret that the information about strontium that you are asking for is very limited and searching for it is also a challenge for us. The Japanese government and research institutes under the government have reported very limited data regarding strontium contamination. But it is important that the Japanese government admits the fact of strontium contamination within 80km from the defunct Fukushima plant. See the website here. Did you know that the US Department of Energy data on the strontium contamination of soil in Japan and its visualization (in Japanese) can be seen on the websites here? Some Japanese experts say, “the Japanese government has declared that no health effects from irradiation below 100mSv (or 100mSv/year) have been confirmed.” Some farmers have established a private food standard of 20Bq/kg, much lower than the Japanese government standard of 100Bq/kg. Do you think that doses under 100mSv or under 20Bq/kg are safe and secure? The Japanese government is using the term “100mSv” in a deliberately ambiguous and confusing manner. The expression 100mSv can have three meanings: (1) a one-time irradiation dose, (2) cumulative irradiation doses, or (3) annual irradiation doses. So 100mSv is not the same as, nor equal to the 100mSv/year that you mentioned in parenthesis. The latter amounts to a 1Sv in cumulative dose over 10 years (which is an up to 10% lethal dose), and 5Sv over 50 years (which is a 50% lethal dose). The present government standard for evacuees to return, 20mSv/year, means that living there for 5 years leads to a cumulative dose of 100mSv, at which the Japanese government admits clear health risks.